I have recently had a hard drive failure so I was forced to reinstall my OS (Windows 7). After a fresh install, I noticed the internet speed became extremely slow (~15 minutes for downloading a 20MB file). I have installed all available windows updates and drivers. I have a cable connection that is supposed to be 40Mbit, and this was the performance I was getting before the reinstall, as well. Between the modem and PC there is a SMC SMCWBR14S-N2 router. I have other machines on the network, a PC with Windows 8 PRO which is connected by a lan cable and another Win7 machine that is using wireless lan. 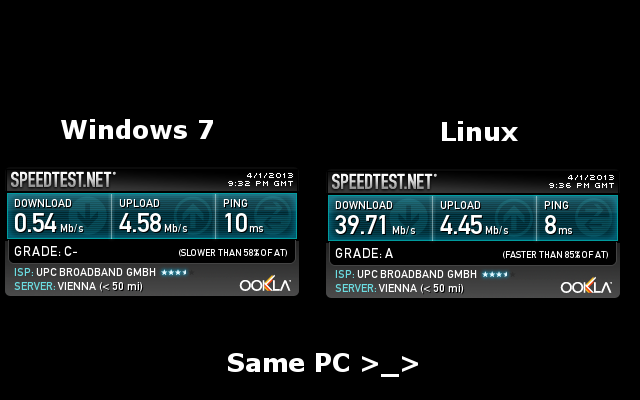 Both of these other machines show full performance (40Mbit) when downloading and also on speed tests. Changing the NIC to a different one. I had a PCI NIC lying around, so I installed it. Unfortunately still slow. I also went to my ISP and traded my modem against a new one. No go. I have no special software installed. This is a fresh reinstall of windows and it worked fine before the reinstall. I am stumped as to what could be the case at this point. Please help. to change RJ45 cable and switch cable to another port of the modem, and to try with ubuntu live cd => to remove external hardware issues. With no other devices connected on the same network and behind a NAT, reinstall a default configuration with every update => If it didn't change, I would suspect a driver issue. I've noticed that you have an ASUS MB. Are you running the AI Suite? More specifically are you running the Network iControl within that suite? In doing some research about this utility, I found dozens of complaints about internet being slow due to having the Network iControl turned on. The one symptom that you don't seem to have is upload bottleneck which was one of the symptoms that the Network iControl had, so this may not be relevant to you. While this does not make sense considering that the Network iControl is supposed to help with prioritizing task associated with internet and network traffic, nonetheless there is evidence. I tried it myself because I was curious and I noticed the same issues others had experienced, but again, the issue usually affects both download and upload speeds. It sounds like your problem is software related not hardware. What is the browser you're using? Try a different one. Check the browser settings such as proxy settings, connection, and security settings. Turn off any antivirus software if any. Run the Windows built in network troubleshooter. Remove any toolbars if any and disable any add ons. If the problem is still not solved, install wireshark and capture data while downloading files from the Internet to figure out where is the "bottleneck" happening. Long shot, but have you considered the partition your Windows install resides on? Because your upload is consistent but your download is suffering, I would guess that there may be some 'write' issues occurring on your Windows partition. Perhaps some driver issues on a SSD, or a heavily fragmented or corrupted section. This also coincides with changing NIC cards and seeing no difference. Maybe you could test the write speed from a usb or some benchmarking software. If you are plugged in via ethernet directly, make sure your wireless is not also turned and connected to the network (or any other network). This can cause interference in Windows. If you torrented your copy of windows, definitely check to make sure you're not using network resources for other nonsense. And especially if you did that, but in either case, you should check what DNS you are using and perhaps try changing it, if it is not the same one you are using in Ubuntu. Not the answer you're looking for? Browse other questions tagged windows-7 networking performance internet-speed or ask your own question. New laptop running extremely slow? why only download is slow but upload is fast on my computer?